Posted by nrhatch in Art & Photography, Nature. Sometimes we are “at one” with the world . . .
Other times, it feels like we are one against the world. The challenges we face are not always susceptible to ready resolution. What about you? Do you more often feel “at one” with the world, or alone against it? Thanks, Debra. We have some amazing visitors on our deck ~ herons, egrets, and the occasional hawk. Thanks, Suzi. He’s a handsome lad (or a bonnie lassie). I agree. I feel most “at one” and “at peace” with the world when I’m out and about with nature. well, you managed to rise to the occasion in this instance. In reply to this, because I didn’t express it well in my first response, is that the essential thing is to be ‘at one with yourself’. (To be in the world but not of it) is the way I remember it being put. Solitude,even in company: not ‘aloneness’, and without the need to project any disparate parts of the self upon the world. Don’t expect you to post these, but I’m wondering if you understood my last submission. It was not about being ‘at one’ with the world, but being ‘at one’ with ‘oneself’. Perhaps you don’t credit there being a difference. But I think the quest not to have a ‘divided conscience’, or ‘disparate parts to the self’ is a primary preparation for the inevitable encounters with ‘adversity’ within the world. I see unity consciousness as one and the same. When I am “at one” with the world, I am at peace with everything in it . . . including myself. I love his contemplative posture. I don’t feel at one with the world, just a small part of it. If you write a short story from it, be sure and let me know. Excuse my ignorance (born & bred town dweller): what bird is it? Wow, what a fabulous pic. I’m hoping the birds and otters still visit after the Australian Pines are cut down. Awesome! I came across one not long ago in a front yard I was passing – it had a bird in its claws. When I came closer it got nervous, firmed its hold and rose up in the air. The captive renewed its struggle (actually, I had been sure it was dead) and fell to the ground, flying and hopping over to the safety of a nearby parked car. I have to say, I had mixed feelings about the outcome… could feel for both. I know just what you mean, Ruth. It’s easier for me to watch hawks and osprey catching frogs, mice, and fish. I don’t like to see them catching birds or bunnies. Good shot of a regal little fella, Nancy! I’m with you – it’s hard to accept all that nature puts under my nose. Including from a little black puss cat. I understand and accept the workings of the food chain . . . but I prefer not to watch. Thanks, Tony. They are wonderful to watch ~ both in the air, and in quiet repose. Watching nature makes me feel “at one” with the world. Great shot Nancy! I feel the same, Barb. Nothing makes me feel more connected to everything than being witness to the wonder of nature. I like sometimes we feel as though we are all “One” in the world-and other times we feel like we are all “One”against the world. But, the beauty of nature-brings us all into tune for our thoughts of being “One” for those moments of serenity and beauty. Thanks, Penny. I agree. Nature reminds us to Be Here Now . . . where peace and happiness reside. Thanks, Carol Ann. Me too . . . I am content, most of the time. Today, I felt a bit disconnected. Too many “balls in the air” at once, I expect. BEAUTIFUL, Nancy! I love the picture and the sentiment. My mojo’s gone walkabout and somehow your post today has been unutterably comforting. Here’s to getting our mojo back! Yes, I thought it was rather nice of him to sit still in such a lovely posture while I fumbled about. Thanks, Cin. I wonder what a more sophisticated photographer could do here ~ with such glorious subjects. oooooooooo that is wonderful. how magestic! Love the photo, he or she is a grand bird! Thanks for sharing. I love the quote about singing 🙂 and will always remember you breaking into song on the island. Beautiful photo. Is that a hawk or a falcon or something else? I have a falcon that visits my office window and I just love him. As far as being One, when I’m in meditation or doing tai chi, clearly one. 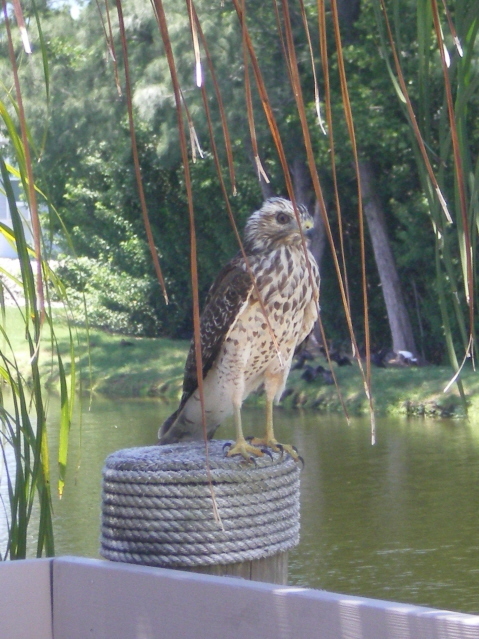 From the photos I checked, a hawk, possibly a red-tailed hawk, or a red-shouldered hawk. Meditation ties me back in to the source too. Ommm . . .
You captured his well. Nice One photo.. Thanks, Connie. Loved the challenge this week ~ One represents the Unity of all. Taking a photo like that makes me feel at one with the world. One drop in the ocean . . . is still part of the sea.